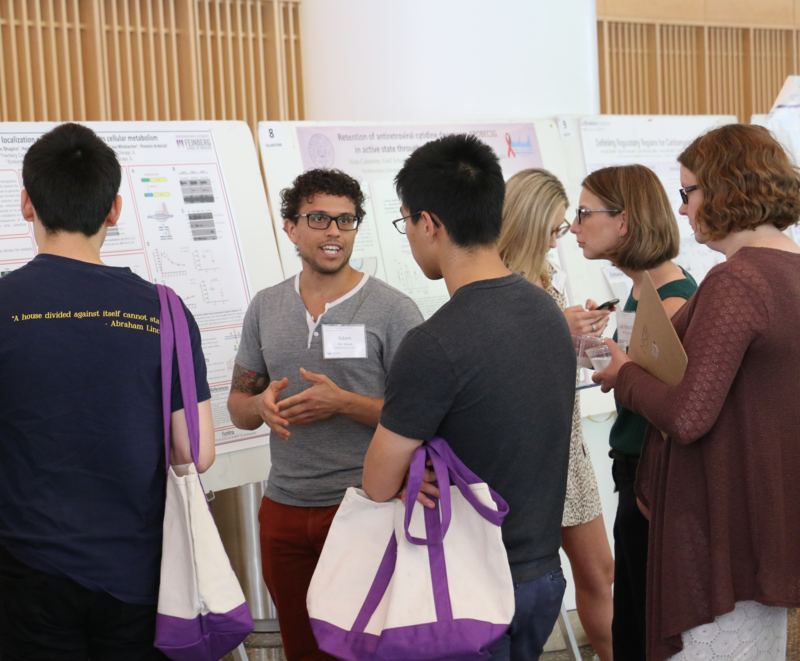 Students and faculty enjoyed scientific posters at the Medical Scientist Training Program Student Poster Session, held July 13 at the Robert H. Lurie Medical Research Center. Students and faculty from the Medical Scientist Training Program (MSTP) gathered to discuss scientific posters and listened to a pioneer physician-scientist present on life after graduate school at the program’s annual student poster session, held July 13 at the Robert H. Lurie Medical Research Center. Students gathered to discuss their scientific posters at the session. 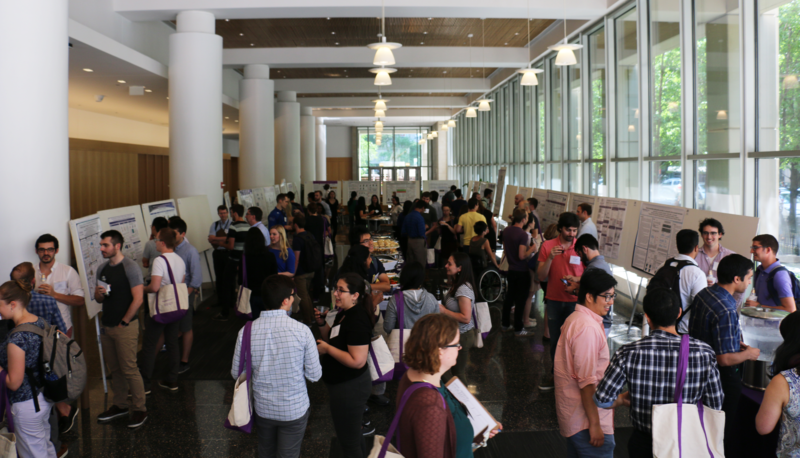 The poster session is the first phase of the MSTP Student-Faculty Retreat, a two-day overnight gathering including a combination of scientific, career-building and recreational activities. Rex Chisholm, PhD, vice dean for Scientific Affairs and Graduate Education, welcomed attendees to the event. Students and faculty then attended the poster session and reception, enjoying food and drinks while discussing posters highlighting projects from current MSTP students. Prarthana Dalal, a fourth-year MSTP student, is investigating a molecular pathway that assists autoimmune activity in white blood cells. 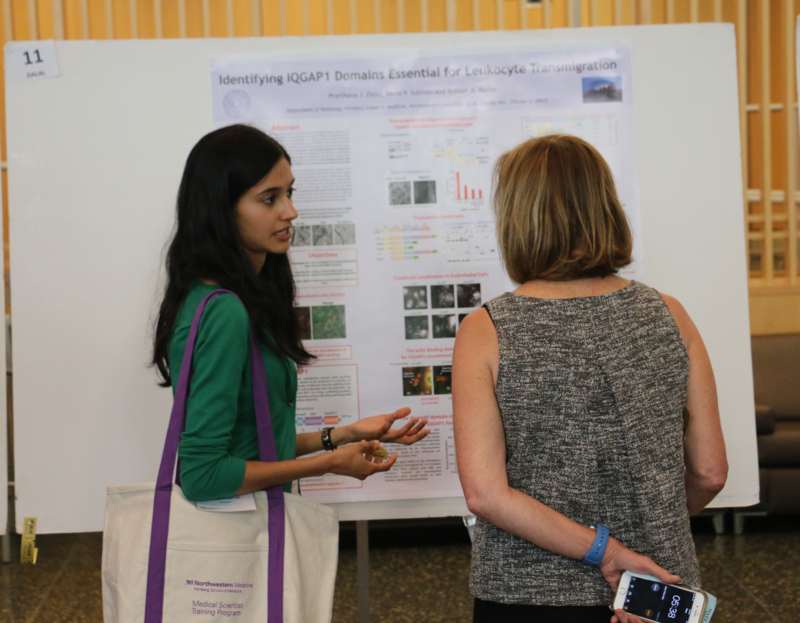 Prarthana Dalal, a fourth-year student in the program, answers questions about her poster. Along with her advisor William Muller, MD, PhD, professor of Pathology, Dalal found that a molecule called IQGAP1 helps white blood cells pass through the cells that line blood vessels, allowing white blood cells to cause damage to the tissue beyond the vessels. In addition to the scientific findings, Dalal said she learned cell staining techniques she will use in the future. Some students focused less on molecular mechanisms and more on translational science, such as Dalton Kim, a third-year MSTP student who developed a small-molecule inhibitor to improve treatment for pediatric T-cell acute lymphoblastic leukemia. In the disease, overexpression of an enzyme leads to downstream chemotherapy resistance in T-cells, so Kim constructed a molecule that blocks the effects of overexpression. 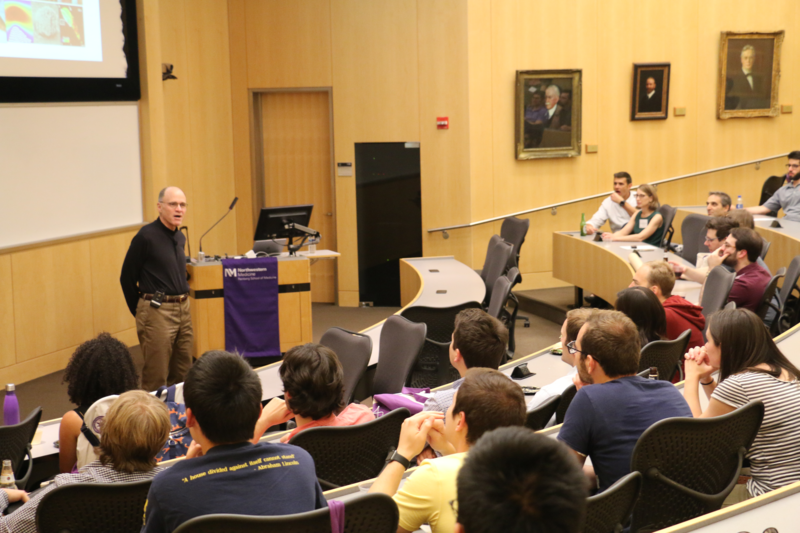 Lawrence Brass, MD, PhD, professor of Medicine at the University of Pennsylvania and director of its MSTP, discussed the evolution of physician-scientist training over the past forty years and advised students on post-graduation plans. To round out the day, Lawrence Brass, MD, PhD, professor of Medicine at the University of Pennsylvania and director of that institution’s MSTP, spoke about the evolution of physician-scientist training over the past forty years and advised students on their post-graduate lives. Chisholm, Muller and Scheidt are all members of the Robert H. Lurie Comprehensive Cancer Center.